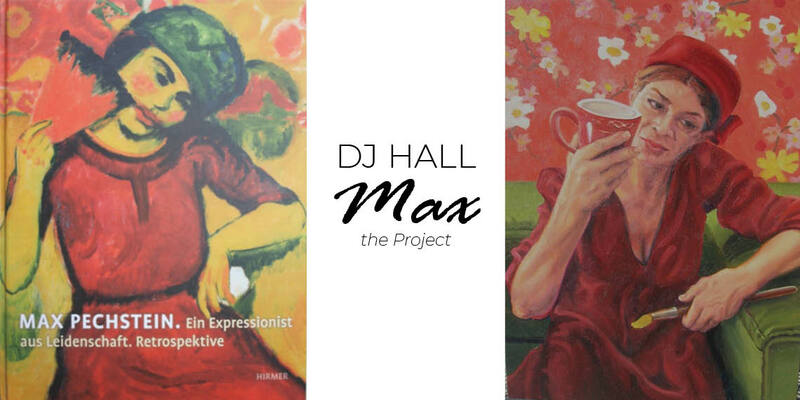 Max Pechstein interpreted by D.J. Hall. It all started with a woman named Charlotte, an elegant blonde in a lush red gown, ensconced within a vivid interior sitting room beneath a wooden arched frame. This exquisite historical gem, painted by German Expressionist Max Pechstein, was groundbreaking for its time and represents one of the largest works from the period predating World War I. It also epitomizes the artist’s distinctive oeuvre in a life spent documenting the people and places of the late 1800s and early 1900s in Germany. Fast forward to 2018, when painter DJ Hall first encountered Charlotte at HOHMANN gallery, a meeting that catapulted the artist into a complex rabbit hole of cross-generational dialogue with the ghost of Max. Hall’s work is most noted for its depiction of women enjoying the leisurely lifestyle of Southern California swimming pool culture, bathed in the kaleidoscope permutations of light and space. As a whole, her work delivers a visual autobiography of female camaraderie and a nod to the fete galante paintings of the Rococo era, which showcased the concept of ”past times” through lusciously pastoral artwork. For this unique experiment, Hall strolled through the annals of Max’s iconic work, exploring the intersection between his populace and hers, creating a panorama of paintings that merge two worlds, bringing his distinct visions into her contemporary lexicon. 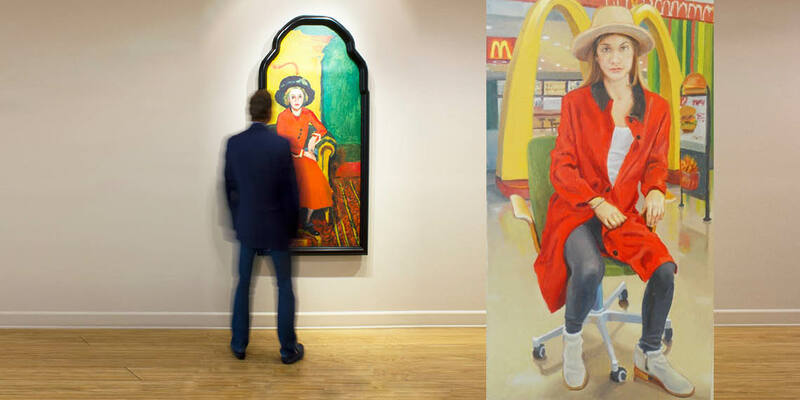 Hall’s Charlotte is decidedly post-millennial, a working girl with all the technological trappings, seated at a McDonald’s with its grand golden arches winking homage toward Max’s memorable initial. In other pieces, Max’s adornments morph into the 21st century environment through clever motifs borne by Hall’s playful hands. A yellow mask worn by a German socialite becomes a shiny pair of designer sunglasses on the eyes of a young German surfer girl. A painting on the wall behind one of Max’s reflective women becomes a high tech flat screen television, broadcasting the modern Handmaid’s Tale drama. A newspaper open on the woman’s lap, belies headlines denoting our current president’s media affairs. Young girls, modeled by Hall’s art students, replace Max’s tea-taking waifs, equipped with their iPhones ever ready for a selfie. A self portrait of the artist reading a catalog of her own work takes the place of a quiet German woman reading a book, and through the window of her room one glimpses an exact replica a sublime Pechstein landscape. A suite of small paintings, informed in large part by the Venice Beach canals near Hall’s own home, is inspired by the many renditions of canals and bridges done a hundred years ago by Max. The colors, textures, and brushstrokes of Pechstein pepper Hall’s paintings, and transport his signature slices of European existence through the sun-drenched filter of modern California. 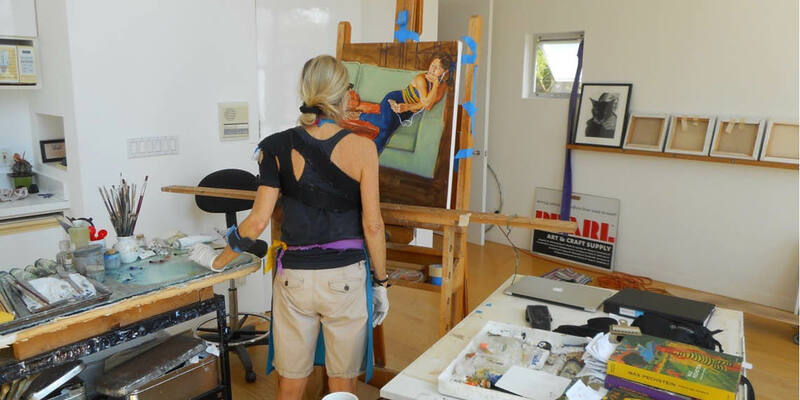 Nearly a century after Max’s brushstrokes hit newly primed canvas, Hall’s work emerges through her own intentional dive into their subconscious union, a process of artistic alchemy evoking work that is quintessentially fresh. The resulting pieces become testament to the underlying string that connects all artists throughout space and time; the string of perpetual fodder that is found in our everyday lives, resonant regardless of chronological or historical distance.